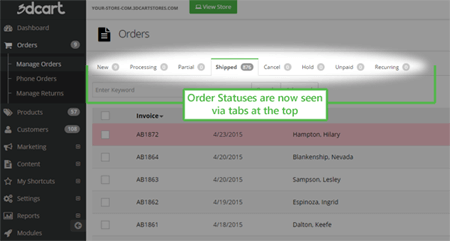 The wait is finally over – 3dcart has officially launched the largest eCommerce update of 2015, version 7.0! After extensive development and feedback from over 17k retailers, 3dcart 7.0 has released to critical acclaim, garnering positive responses from users and industry experts alike. Hailed as the new industry standard for eCommerce platforms, 7.0 is a new, freshly innovative platform, expertly rebuilt from the ground up. In addition to a completely redesigned Control Panel and Dashboard, version 7.0 also brings about the introduction of a built-in point-of-sale system, REST API, Multi-Channel selling, native support for Visa Checkout, a New Checkout Experience, plus many other features designed to provide an edge-cutting, technologically advanced all-in-one eCommerce solution. Responsive: We’ve made it so that you can use tablets and still have a good experience browsing around. Use the device that you're most comfortable with! 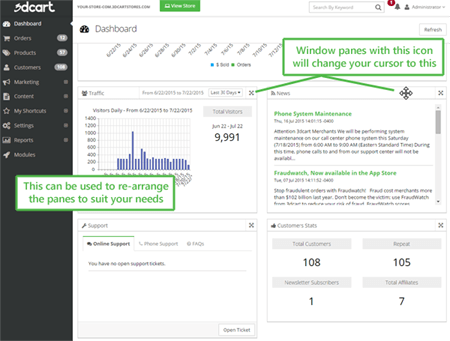 Moveable dashboard panes: Rearrange some of the informational screens to help you customize your “At a glance” view. It’s your store; organize your admin however you see fit! Order management: The order details page was redesigned to increase efficiency when processing orders. Intuitive: We’ve re-organized settings and pages to make the configuration of the store more intuitive, including a collapsible menu bar, flyout menus, and new layout options offered in various colors to better suit your mood and taste. Admin Notifications: Customize which activities you’d like to receive notifications for. Additionally, if your store has any pending issues that may interrupt your store’s functionality, these will be shown in the notification window as well. Global WYSIWYG Toggle: Turn WYSIWYG on (or off ) globally for every section of the Online Store Manager. Versed in HTML? With one click, every WYSIWYG section can be turned off. Furthermore, with upgrades to our core platform and infrastructure, 3dcart 7.0 is the most powerful, scalable, fastest hosted eCommerce platform yet. Feel secure in the knowledge that 7.0 can handle massive influxes to traffic and sales – up to 240 sales per second! Whether you’re a small business just starting out or boasting high volume sales and traffic, 3dcart has everything you need and want to efficiently manage your online store.